out. All their color and nutrition - gone. They were pale pink. My healthy dinner had boiled into anemic chunks of unrecognizable vegetable matter. 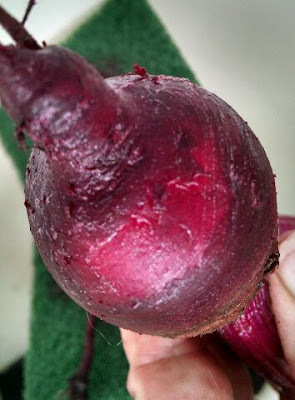 It was years before I tried again, and then only because the beet seeds were marked down to 25 cents a pack. At least I got some beets! The third year I planted them! I just couldn't bring myself, with my quest for efficiency in all thing housework, to cook AND THEN prepare the beets additionally by slicing, dicing, canning, whatever. Let me tell you, when you make pickles, they go in raw. It's the boiling brine that cooks them, and they aren't peeled first. Even canning tomatoes seems like less work than anything you can do to eat a beet. 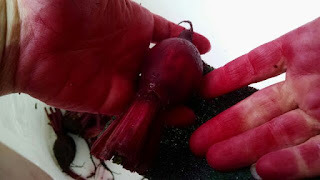 I'm going to try this Beet Chips recipe, since the broccoli leaf chips turned out so well. My foodie, preteen son bought himself a mandolin slicer last year. He said I could borrow it. (How pathetic am I? Borrowing cooking equipment from my kid?) I'll try to ignore that it's Gweneth Paltrow's recipe. I don't know her, but her condescension in interviews toward people who are too exhausted to cook their kids' healthy food every single night is enough. I don't want to know her. I'm two-faced enough to use her recipe though. Today I cleaned a couple beets. That's it for me. Chocolate for dinner. Check back soon! I'll have more pictures! 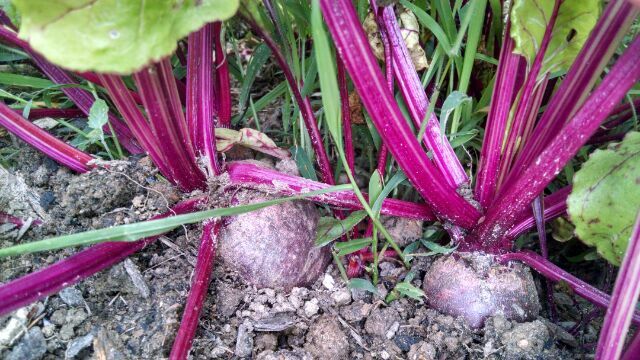 I finally picked my beets I planted 5 months ago from seed just yesterday! They are beautiful and I have the best intentions of preparing them very soon. I just dread the "prep" part of the preparation. Although I made an awesome soup last fall with beets. I was so proud it was super PINK! I took it to work and shared it with others. Few tried it and some of those few loved it. I kept telling them how healthy it is for them. 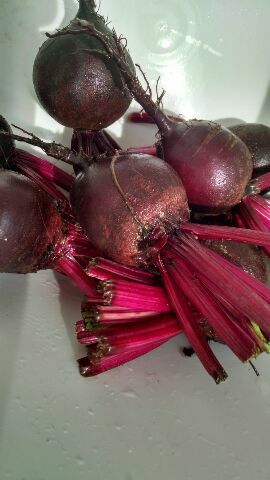 Thank you Caley for re-Enforcing the power of Beets!